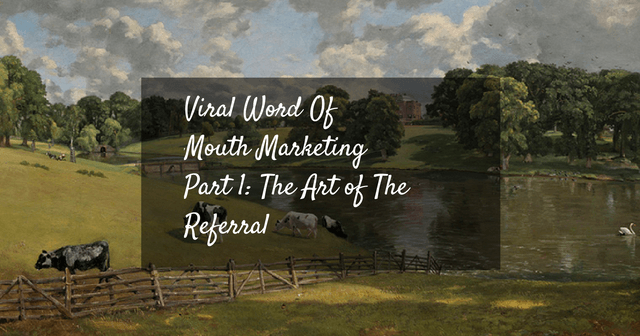 This is part one of three of the Viral Word of Mouth Marketing Series of blog posts. Please see the bottom for links to the other two as they become available. Trying to get a business loan for marketing is a bit of a paradox. You’re planning to do some marketing to get more customers, but you need extra capital to execute your plan, and so you start looking for a business loan. Unfortunately, many lenders might require you to have more customers—at the very least, the revenue new customers would generate. But, you need that loan to execute your marketing plan and get the customers. What do you do? Fortunately for you, one of the oldest and most effective marketing strategies is 100% free. It will cost you zip, zero, zilch, nada—just a little extra effort. Way back when, the only form of advertising was word of mouth. There were no billboards, no radio, not even newspapers. The only way you knew which inn was the best in town, was the recommendation of your friends and associates telling you which one they thought had the cleanest beds—and you trusted them. Even today, word of mouth marketing should be a huge part of your business strategy. With review sites like Yelp, and all the social media sites, you have to make sure your customers are leaving happy and excited about their experience. So here’s the foundation you need to get new customers through referrals. And that’s the scary part, have you ever heard “Oh, I’ve heard they’re not that good.” or “Yeah, my friend got ripped off by that place.” This is every business owners nightmare, and it should be yours too. One angry customer is not just one customer gone, it’s his friends and associates too. Make sure your product and service is the best you can provide, and you’ll get referrals naturally. This goes along with my first suggestion. If you listen to your customers, and find out what they want, you’ll achieve two very important things. First, you’ll receive valuable insight into how customers view your business. Second, you’ll start building a relationship with that customer. People like being listened to and if they feel they’re helping your business, they will develop a strong attachment, turning them into brand advocates, and those are the kind of people that give referrals. People are much more likely to refer someone they have a relationship with. Listen to your customers, talk with them, get to know them as much as possible. If you have a genuine—keyword genuine—relationship with your customers, they’ll view you as more than a business, they will view you as a friend. That’s why barbershops and salons do so well with referrals. They have that time with you in the chair, building that relationship. Make friends, get referrals, it’s simple. If you master the art of getting referrals, you’re going to increase revenue, increase your customer base, and lower your marketing costs. It’s really worth your time and effort. Next Thursday, I’m going to talk about the best ways to surprise and delight your customers, bringing in an enormous amount of referrals. If you’d like to get the next post in your inbox, along with all our other great content, sign up for newsletter here.